Two ninja turtles down, two to go! Yesterday we saw the tomb of Raphael, which is in the Pantheon. Today we saw a document handwritten by Michelangelo, in a special exhibit of documents from the Vatican Library, which was in the Capitoline Museums. And that was only one of many highlights. I was woken this morning by the tell-tale itching of a mosquito bite on my hand. Feeling my face, there was also a big swollen lump there under my right eye. It must have been about 05:30 as it was still dark, the occasional bird call indicated the imminent start of the dawn chorus. I dozed a bit more, and when it was light I discovered that the windows in the bedroom had been left open, allowing the offending insect in during the night. I thought M. would have closed them before getting into bed, and didn't check myself when I followed a bit later. We spotted the bloodsucker and killed it, so hopefully there won't be a repeat tonight. I got up and had breakfast while M. snoozed a bit more, until around 08:00. Then she got up and was ready quickly for today's expedition. We walked south past the Pantheon again and up the hill to the Piazza di Campidoglio, where the museums are. We stopped along the way at the same bar as yesterday, where M. had another cappuccino and I had a cornetto con cioccolato. It was dripping with nutella, all sweet and gooey inside, and delicious. Thus charged up, we tackled the climb up the hill and the museums. There were several dozen tourists milling about in the piazza, but there was no queue to get into the museum. After filling our water bottle at the drinking fountain partway down to the Forum, we paid our €12 entry fee each. I offered the woman €25 in notes, hoping to get a coin in change, but she actually gave back the €5 note and asked if I had four euro in coins! I dug some coins out and handed them over, this reducing our supply of loose change instead. Immediately inside, another woman greeted us and instructed us to leave bags in the cloak room, which contained keyed lockers of various sizes. I asked her if photography was allowed and she said yes, but no flash, and no photography in the special exhibition. 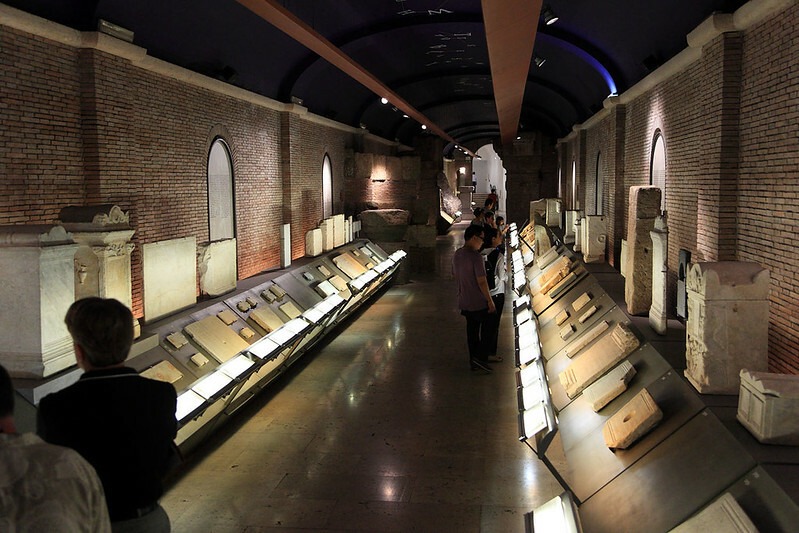 That special exhibition was what we saw first, and it was titled Lux in Arcana, a collection of documents from the Vatican's "secret archives". This was an amazing set of historically important documents, including things such as the papal bull excommunicating Martin Luther, a concordat between Napoleon and the Vatican, Pope Alexander VI's bull dividing the New World between Spain and Portugal, letters from both Abraham Lincoln and Jefferson Davis (President of the Confederate States of America) written during the American Civil War, proceedings of the trial of Galileo, a letter by Michelangelo requesting a break in the deadlock of the church holding out from paying his workers, and the letter from the English Parliament requesting Pope Clement VII annul Henry VIII's marriage to Catherine of Aragon, on threat of dire consequences to the Catholic Church if the request was refused. And this is a mere sampler of the documents we saw; the exhibit contained about a hundred different documents. Following this, we traversed the galleries of the museums to see the permanent collection. This was mostly Roman sculpture, and that mostly of marble, with a few bronze pieces thrown in. 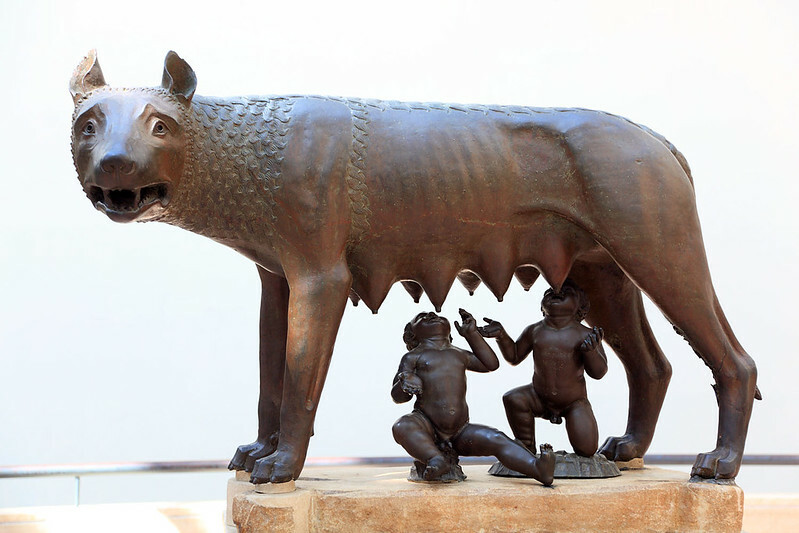 The highlights here were the Lupa Capitolina, the famous bronze Etruscan statue of the she-wolf suckling Romulus and Remus, and the bronze equestrian statue of Marcus Aurelius (a copy of which is the statue outside the museum in the Piazza di Campidoglio). 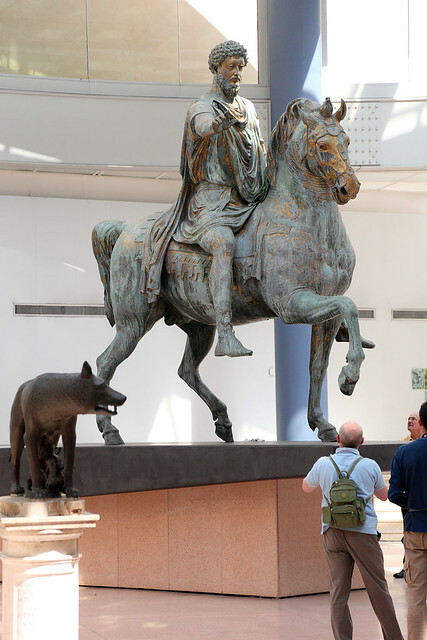 There were also the head, hand, and foot fragments of a giant marble statue of Emperor Constantine, a marble bust of Medusa by Bernini, and the Capitoline Venus statue. After completing the first floor, we took a break, heading back to the cloakroom to have a snack of the biscotti from yesterday and drink some water. Then it was on to the top floor, which held a collection of paintings, most by Italian artists I hadn't heard of, but I spotted a couple of Tintorettos and Veroneses. The top draw here was a painting by Caravaggio of a young couple. The rest of the floor had a collection of porcelain figures, similar to what we saw in the porcelain museum in Dresden. In the underground passage beneath the piazza which connects the two halves of the museum was a collection of stonework with inscriptions, mostly from the Roman era, but also some with Greek and Hebrew text. About half were funerary stones, while others were plaques for workers or dedication stones, and there was one which was labelled as a game board for some sort of Latin word game. Connected to this gallery was a tunnel with windows showing the excavation of the Tempio di Veiove, a Roman temple that was found under the piazza. This connected to a viewing gallery with a fantastic view out over the Forum, showing it from an angle we hadn't seen before. 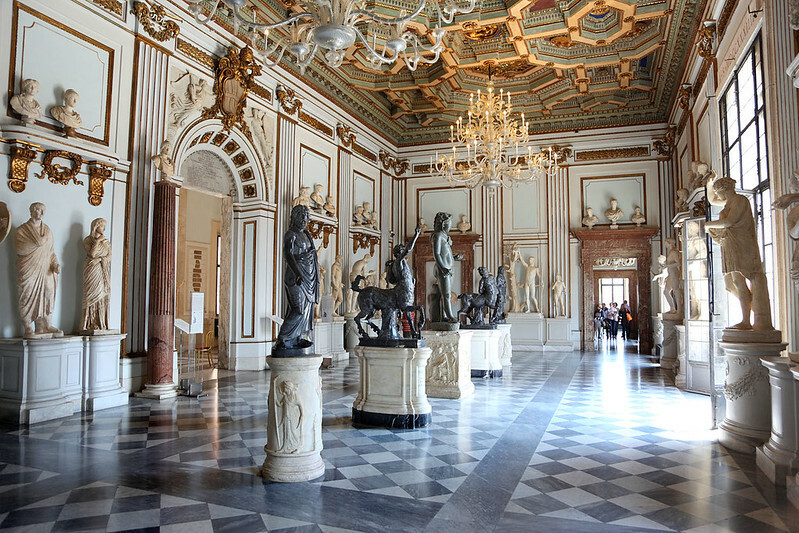 The second building in the museum housed more marble sculpture, with many of the pieces here being complete and in much better condition than the often damaged works in the first building. Several Roman gods and goddesses were here, as well as a room of busts of many of the Roman Emperors, and another room of Greek philosophers. The best room was a grand room with a balcony overlooking the piazza below and a gold encrusted ceiling. In here were five black marble statues, of Zeus, Asclepius, a toddler Hercules already wearing a lion cloak, and two centaurs. Further around was the famous Dying Gaul statue. Finishing the second building, we went back to the first one to complete the second half of the disjointed second floor. This held more of the Vatican documents, plus a small collection of precious stones carved into seals, and gold and silver coins. This finished off the museum. We visited the gift shop on the way out and picked up a catalogue of the Vatican documents in the special exhibition, so we could remember all of the amazing things we'd seen. By this time it was about 13:30, and we headed straight back to our apartment to make ourselves a late lunch. We toasted slices from the loaf of bread we'd bought the other day and made sandwiches with it. M. had Vegemite while I had cheese, prosciutto, cucumber, and tomato. After eating, we went out to the nearby bakery to pick up some treats for dessert tonight. We got a couple of Napoletani (biscuits filled with a mixture of figs and nuts), a small lemon tart, a cherry tart, and a thing that looks like it's just nuts stuck together with a glue of black treacly stuff. That one should be interesting. We also got three small bread rolls to go with dinner. After dropping those back at the apartment, we went over to the supermarket to buy some vegetables and salad to go with the risotto. We picked up a couple of Italian zucchinis with the flowers attached, some mixed salad leaves, small tomatoes, a bag of three onions, and M. found a pack of little meatballs to go with all the vege stuff. 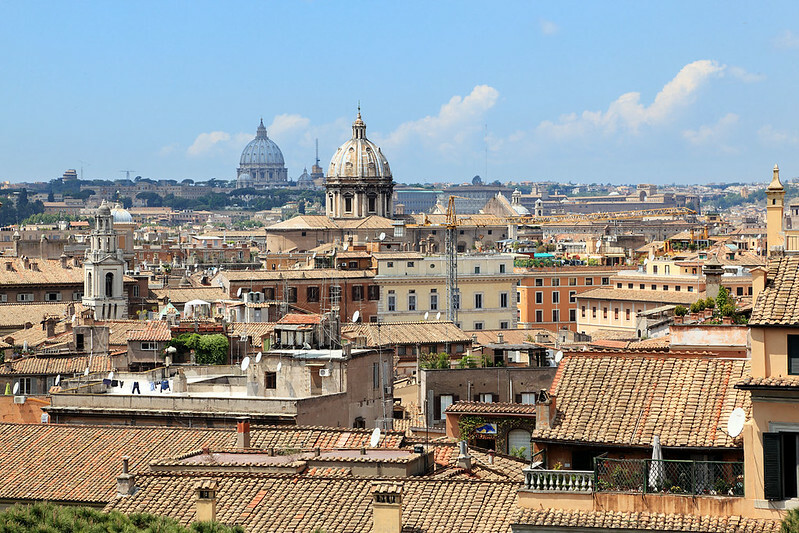 We also grabbed more Weetabix for breakfast, milk, a bag of little biscuits for snacks while out walking around Rome, and some toilet paper for the apartment. After dropping all of this off, we decided we had time for a short walk before starting to prepare dinner. 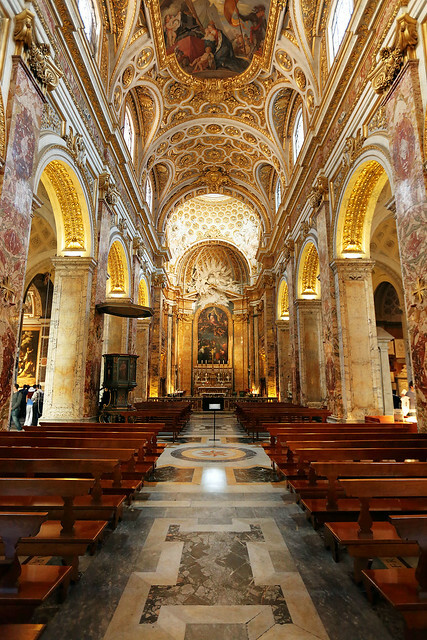 I checked the Lonely Planet and found the nearest recommended sight, which was the Chiesa di San Luigi dei Francesi, which boasts three works by Caravaggio in one of its chapels. On the way out, Signora Cardelli emerged from her apartment at the sound of us leaving, and greeted us for the first time. She was a thin woman about M.'s age, with curly blonde hair. She'd returned home this morning and it was the first chance we'd had to meet. She said she hadn't checked the money yet, but will do so later, and said we could contact her if we needed anything. After a short walk south, we found ourselves in an area which suddenly felt French, with a couple of French book shops next to the Chiesa di San Luigi. Inside the church, the signs were all in French first, Italian second, and English only on a small subset of them. 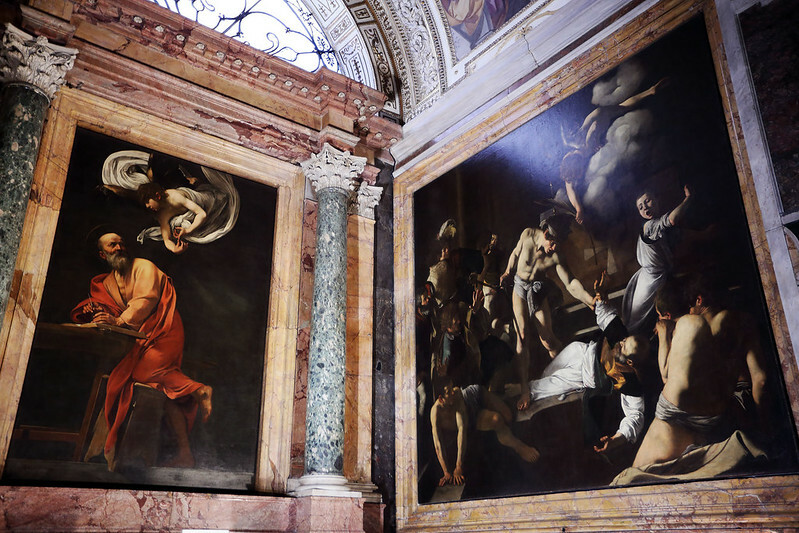 The church had some interesting features, but it was obvious what everyone was in there for, as a crowd clustered around the Contarelli Chapel containing the Caravaggio paintings. This was a trio of works depicting St Matthew, his calling to the church (The Calling of St Matthew), his martyrdom (The Martyrdom of Saint Matthew), and a painting showing just the saint and an angel hovering above him (The Inspiration of Saint Matthew). They were impressive, brooding works, in Caravaggio's distinct heavy chiaroscuro style. Once done there, we strolled back to the apartment via a different route, chosen to pass by Gelateria Giolitti, where I picked up a small cup of strawberry gelato. The service was hectic and it took some time to procure my cup, which was smaller than I'd expected even when ordering the small size. But the gelato was good and polished off as we returned home. We figured we had time to have showers before Tony arrived for dinner, so M. jumped in first. As she emerged, our door buzzer rang, and it was Tony in the stairwell outside, half an hour early! He chatted with M. while I excused myself for my own shower, then we started cooking the dinner of risotto, zucchini, meatballs, and a salad. We served it with the bottle of white wine that was waiting in the fridge for us when we first arrived here. It was called Elephas and was from the Lazio region around Rome. The blurb on the back was in Italian, but the best I could understand it, it said the wine was fermented in caves, in which had been found fossils of ancient elephants! It was tart and slightly herby, like a semillon-sauvignon blanc blend. The risotto was nice, but needed some salt, which unfortunately we didn't have. The tomatoes were delicious and really made the salad. After dinner we cut the lemon and cherry tarts in half and Tony and I had half of each one each. They were delicious. Tony said he'd been to see the catacombs down near the Via Appia today, and recommended them. His plan was to try the Vatican again tomorrow morning if he could get up early enough. Our plan was to take a day trip out to Tivoli to see Villa d'Este. We arranged to meet at around 19:30 tomorrow for dinner again, but this time outside Tony's hotel over near Barberini, so we could dine in a different neighbourhood, and then afterwards M. and I could walk back via the Spanish Steps and take some night photos with the tripod. Last updated: Wednesday, 19 July, 2017; 01:21:03 PDT.